GameSpy online server browser no longer works by default due to GameSpy services being shut down. Can use multiplayer with OpenSpy. 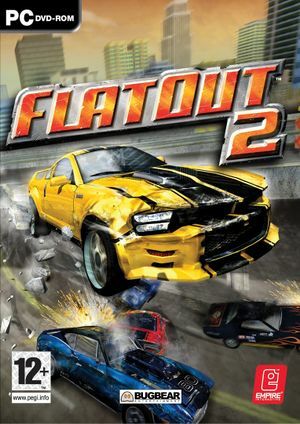 Remade as FlatOut: Ultimate Carnage in 2008. Europe: StarForce 3.0 DRM[Note 1]. The Mac App Store version does not support online play. The Linux version found at GOG uses Wine wrapper to run the game. Download BFS file and place it in the installation folder. Open the filesystem file with a text editor. Game launcher (access with -setup parameter). Must be enabled in options and plugged in before launching; default controls are unintuitive but can be rebound in options. Requires user to press ↵ Enter on the keyboard to begin a race. No controller support in menus. Not functioning on more recent controllers; prompts do not match required input. Rag Doll mini-games (Party Mode). See also FlatOut 2 Splitscreen Mod. 8 Use the patched FlatOut2.exe. Not available in the Mac App Store version. 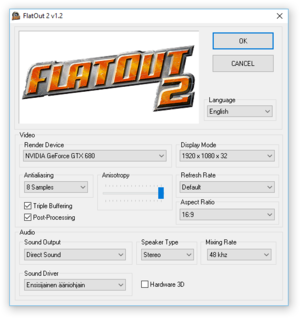 GameSpy GameSpy has been shut down; use the patched FlatOut2.exe. ↑ 3.0 3.1 File/folder structure within this directory reflects the path(s) listed for Windows and/or Steam game data (use Wine regedit to access Windows registry paths). Games with Steam Cloud support may store data in ~/.steam/steam/userdata/<user-id>/2990/ in addition to or instead of this directory. The app ID (2990) may differ in some cases. Treat backslashes as forward slashes. See the glossary page for details.